Do you have photos, historical accounts or other items pertaining to the Brandon area? Would you like to share this historical information with the world? LakesnWoods.com would like to publish your Brandon photos (current or historical) or historical accounts on this website. Original materials can be returned and your privacy will be respected. Brandon is a city in Douglas County, Minnesota. 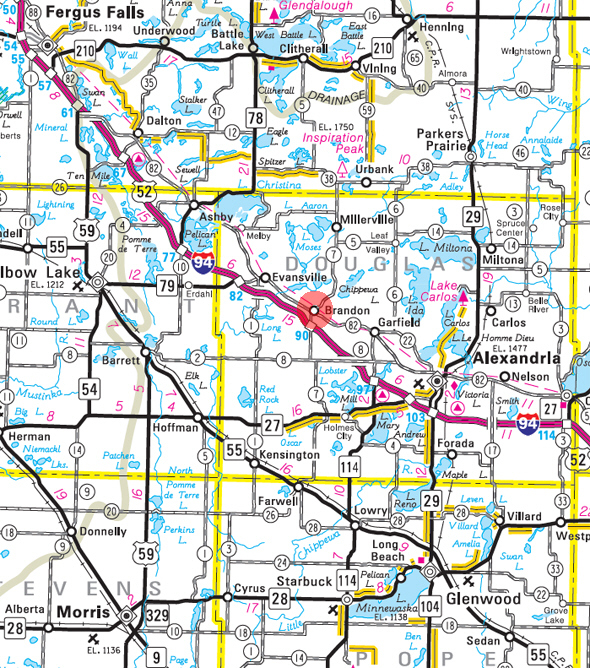 County Roads 7 and 82 are major routes in the community, and Interstate 94 is nearby. According to the United States Census Bureau, the city has a total area of 0.48 square miles (1.24 km2), of which 0.47 square miles (1.22 km2) is land and 0.01 square miles (0.03 km2) is water. The elevation is 1,398 ft (426 m) above sea level. As of the census of 2010, there were 489 people, 207 households, and 139 families residing in the city. The population density was 1,040.4 inhabitants per square mile (401.7/km2). There were 220 housing units at an average density of 468.1 per square mile (180.7/km2). The racial makeup of the city was 99.2% White, 0.2% African American, and 0.6% Native American. Hispanic or Latino of any race were 2.2% of the population. There were 207 households of which 29.0% had children under the age of 18 living with them, 54.6% were married couples living together, 10.1% had a female householder with no husband present, 2.4% had a male householder with no wife present, and 32.9% were non-families. 28.5% of all households were made up of individuals and 6.8% had someone living alone who was 65 years of age or older. The average household size was 2.36 and the average family size was 2.90. The median age in the city was 34.5 years. 26.4% of residents were under the age of 18; 7.3% were between the ages of 18 and 24; 24.8% were from 25 to 44; 26.3% were from 45 to 64; and 15.3% were 65 years of age or older. The gender makeup of the city was 53.0% male and 47.0% female. 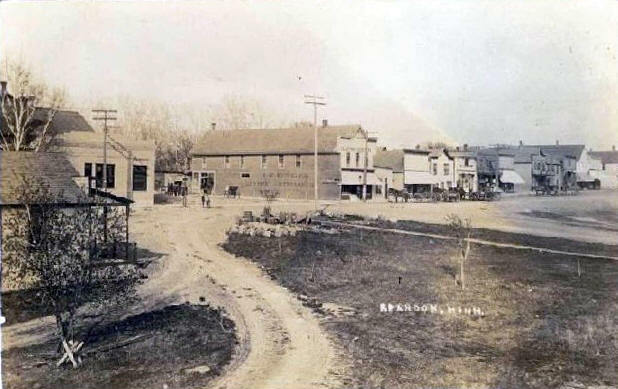 BRANDON, settled in 1860, was established as a township September 3, 1867, and was then called Chippewa, for its lakes and river of that name, used as a "road of war" by the Ojibwe in their forays to the Dakota country. Previously it had a station, also named Chippewa, of the Burbank stage route from St. Cloud to the Red River at the home and hotel of Henry Gager, on a low hill about two miles north of the present railway village, which received its name of Brandon for the birthplace of Stephen A. Douglas in Vermont, as laid out in August 1879. 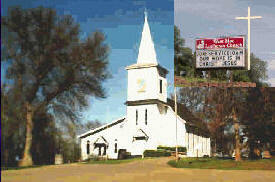 The township was also renamed. 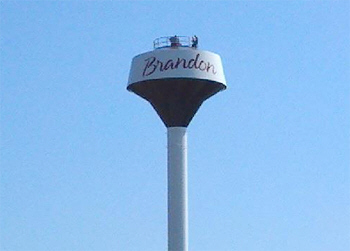 The city of Brandon was incorporated November 22, 1881. It was laid out by its owner, Lt. George A. Freudenreich. Its post office was named Chippewa Lake, 1861-69, before its present name. Street scene, Brandon Minnesota, 1900's? 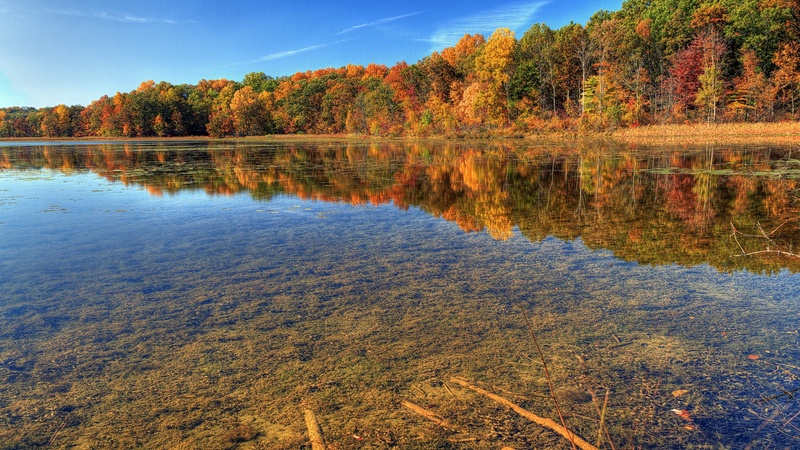 Get out and enjoy the beautiful gem known as the Central Lakes Trail! 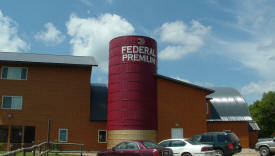 It begins at the southeast edge of Fergus Falls and is available for all to enjoy. This 14 foot wide, 55 mile long, nearly level, paved trail is a superb asset for residents of the region as well as visitors. It is one of the nicest paved trail corridors in the state. You will likely feel like you are in a narrow park that just keeps going on and on. The trail is built on a former railroad line stretching between Fergus Falls and Osakis. It additionally passes through the communities of Dalton, Ashby, Melby, Evansville, Brandon, Garfield, Alexandria, and Nelson. 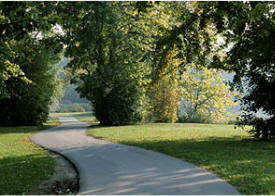 The trail traverses through, or next to, a scenic mixture of woodlands, grasslands, lakes, wetlands, and farm country. 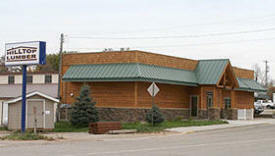 Long Lake Lodge and Conference Center is a lodging, meeting, shooting sports, and hunting facility located in the heart of West Central Minnesota. The Main Lodge features a retail store, bar and restaurant facilities on the first floor. The second level, accessible by elevator, includes four bedrooms, sauna, 11-person hot tub, meeting room, and a great room with a large stone fireplace. All the rooms in the main lodge have access to the second level kitchen. 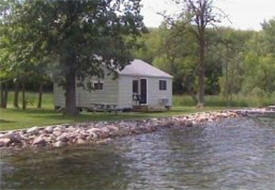 The Northwoods Cabin has been fully remodeled and accommodates small groups. (4 to 7) Hunting opportunities at the licensed hunting preserve occur from September to April for pheasants and quail. No license required! Shooting enthusiasts can sharpen their skills at the lodge's sporting clay and five stand ranges. 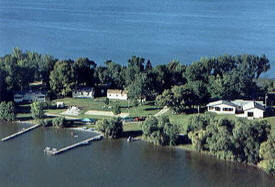 Shady Creek Resort lies on the banks of a creek that connects Lake Aaron and Lake Moses. 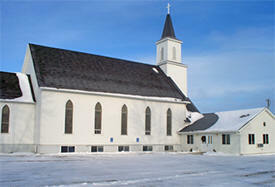 It is located 7 miles north of Brandon and 2 miles west of Millerville. You will be immediately impressed by the relaxing atmosphere that surrounds it. 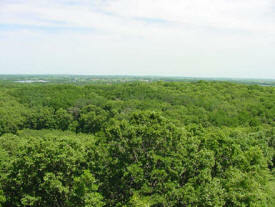 It is 3 miles from Pine Ridge Golf Course and 5 miles from Inspiration Peak, the second highest landmark in Minnesota. There is something for everyone at Westwood Beach Resort. Whether you're seeking a quiet week to relax or join in the festivities of the local community, veteran resort owners Ray and Diane Wood will ensure all your needs are met. Hang out at the resort and enjoy: sauna, playground, water trampoline, water skiing, tetherball, water volleyball, grilling, camp fire, horseshoes, open area ideal for your favorite ball game, paddle boat, and excellent fishing in Big Chippewa Lake. Westwood Beach Resort's guests also enjoy free use of the Pavillion, great for gatherings of up to 50 people. Certified Aqua Floats are have been manufactured for 40 years. 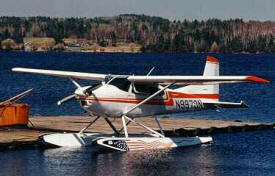 We continue to expand the number of models of aircraft certified on our floats. (see "certified Aquas, what they go on & what they cost) Aqua now builds floats for the experimental market too--they are available fully built and ready to go on your airplane. For details see" KIT-built Aquas--doing it your way"
Bill Ness Construction LLC specializes in home remodeling, new construction, and additions for residential and commercial establishments throughout the Brandon, MN area. We deliver quality workmanship without compromise. Trust our highly skilled and professional workers to give you the highest standards of service every time. Our polite and professional staff are always ready to answer your questions, so don't hesitate to give us a call. 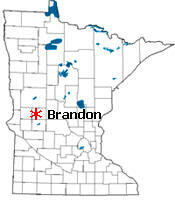 We proudly serve Brandon, MN and surrounding areas. Billmarks Lake Area Insurance, Inc. is an independent full service insurance agency serving the greater Alexandria lakes area. We offer all types of insurance including: Personal Insurance - automobile, homeowners, seasonal homes, renters, farm owners, motorcycle, ATV, watercraft, personal umbrella liability, and collector cars. Business Insurance - contractor, commercial property, commercial general liability, business auto, bonds, employment practices and worker’s compensation. Health Insurance - individual and group health insurance, medicare supplements, dental Financial Insurance - life insurance, annuities, disability Choose your best option with names like Grinnell Mutual, Allstate, Progressive, Austin Mutual, Cincinnati, North Star, Safeco, Blue Cross and Preferred One, to name a few. The Brandon Fire Department was founded on January 4, 1889 and has been protecting the Brandon, MN area ever since. 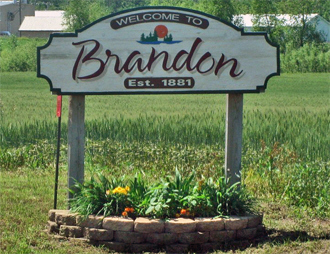 We currently serve the City of Brandon, Brandon Township and portions of Moe and Urness Townships. We protect properties valuated at over $99 million dollars. 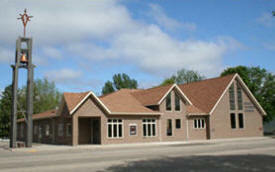 Bremer Bank offers banking services throughout Minnesota, Wisconsin and North Dakota. Bremer Bank also offers the convenience of internet banking for those on the go. Gardonville provides service for four exchanges in west central Minnesota, servicing the towns of Garfield, Brandon, Evansville, Millerville, Erdahl, Leaf Valley and Melby. 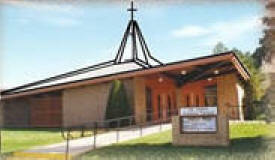 Its business office is located in Brandon, Minnesota. Gardonville is a member-owned cooperative that pays capital credits to its members. Homeowners, contractors and do-it-yourselfers in the Alexandria, Minnesota lakes area have relied on Hilltop Lumber for over 20 years. You can depend on Hilltop Lumber for good advice, friendly prices and building products you can count on. Our knowledgeable staff dedicated to Hilltop’s goal of 100 percent customer satisfaction. Once you have done business with us, you will see why you Build It Better With Hilltop Lumber! 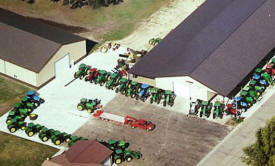 JB tractors specializes in quality used tractors and handles a wide range of makes and models. We mainly deal in John Deere, Case-IH, New Holland and Mc Cormick. Most of our tractors are late models with low hours, they have MFWD, cab/air and new rubber all the way around. "We always have 50 tractors in stock." Lake Country Assisted Living Incorporated in Brandon, MN is a Class F home care provider, licenses by the State of Minnesota. Our facility is designed for those, who are 55 and older, who find it difficult to continue living in their own home, but do not require the care of a skilled nursing facility. We offer various levels of services, with the ultimate goal in promoting independence, dignity, privacy, and safety. 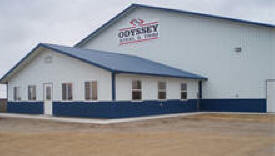 As a full-line steel manufacturer, Odyssey Steel & Trim operates using state-of-the-art machinery and technology, which offers complete accuracy. We are capable of providing steel and related products for a variety of building projects from a small fish house to a full length dairy barn. We also operate as a lumberyard offering all the materials to complete projects from start to finish. Aside from offering quality products, we also provide general contractor services that allows you to make one stop in locating quality materials as well as finding qualified individuals to complete the project. We strive to accommodate schedules, deadlines, and unexpected needs by contractors and individuals alike. For all your lawn care and dock services needs, contact Tasto Lawn & Dock Service of Brandon, MN. Our company offers quality lawn care maintenance and dock services to the Alexandria, MN and surrounding areas. With fully insured crew, we can assure 100% customer satisfaction. We also offer a free estimate. Snow removal and annual programs are available. 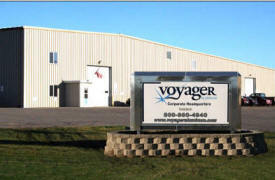 VoyageR Aluminum is your "One Stop Aluminum Shop". We provide everything from your basic & custom extrusions to sheets & fabricated parts. VoyageR Aluminum has what you need for all the projects you need completed!